As the red, white and blue flyers begin to be recycled and the repetitive politician commercials conclude American women can still feel victorious about the results of the 2012 Election. The 113th Congress will acquire multiple firsts for women. The New York Times confirms that New Hampshire was the first state to send all women delegates to Congress. There will be 20 female senators, which, is the most in U.S. history. The first out lesbian woman and the first disabled woman will serve in the House of Representatives. Unfortunately women make up 51 percent of the U.S. population, yet in politics they are the minority. According to New York Times female congress members only hold 20 percent of the majority rule in Congress. However, even though women hold less than a fourth of the voice, they still do not speak as frequently on the floor compared to men. Female congress members use only 60 percent of the time on the providing their perspective compared to a male representative. Americans continue to witness misrepresentation repeatedly in the American government. Women were granted the right to vote almost over a century ago, but if women continue at this consistent rate “women may not achieve parity for 500 years” reported by Miss Representation. Carolyn Shafer introduces her piece by explaining a lesbian does not exist. There is not definition for this type of woman. The author resorts to looking up the word lesbian in multiple sources even well known dictionaries yet they define a lesbian inaccurately. She takes a small example of how even the Webster dictionary cannot define a lesbian and stands back to take a glimpse at the larger picture. Women do not exist. “The word ‘woman’ was supposed to mean female of species, but the name of the species is ‘Man’. Shafer goes into detail of the different ways and tactics lesbians and women have been oppressed but in the conclusion she grants hope for them. She wants women to understand there is power in defining who you are and there is power in oppression. As our class was broken up in groups we were arranged in different environments: the stage, the outsider and the observer. As women we fulfill all these roles. We were placed on the stage and we felt ourselves being on the spot light. We also were oppressed when we were placed outside of the classroom. But once we were moved back into the room as observers we felt empowered. Shafer wants women to know when women are seen (on stage) they have authority and oppression actually benefits women because it eventually leads to liberation. We discussed THIS in class today and I said I would post it because it was something that hit close to home in a way. I feel like I’m always getting talked down to or having something explained to me in a different “dumbed down” version. I constantly feel like I am sticking up for myself and my ability to have an intellectual conversation without things having to be explained to me. 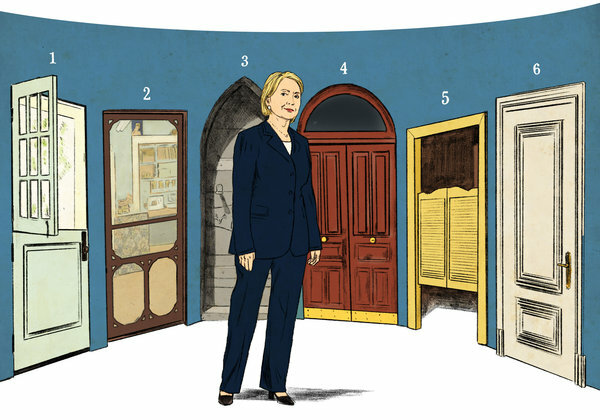 This article was in the New York Times and discusses what Secretary of State Hillary Clinton will do next. There is a lot of talk about how she could run for president in 2016 and that she would have a LOT of experience to back her up. What do you think? Would it be a good idea for her to run or would there be too much drama over the fact that she is a women? Mia Love was born on December 6, 1975 in Brooklyn, New York. Her full name is Ludmya Bourdeau. Both of her parents immigrated from Haiti in 1973. Her birth granted her entire family citizenship under an immigration law that was set to expire in 1976. She graduated from the University of Hartford with a degree in performing arts. After graduating college she joined The Church of Jesus Christ of Latter-Day-Saints and moved to Utah to be closer to the temple. She had become civically involved in 2002 where she was the spokesperson of her community. In 2003 she won a seat on the Saratoga Springs City Council, where she became the first Haitian American elected official in Utah County, Utah. After six years on the council Love was elected mayor in 2009. As City Council woman and eventually Mayor, Mia led the city through a period of 1700% population growth in a decade. Under her leadership, the city was able to successfully navigate the drastic transition from agricultural fields to a booming residential community. One of her first acts as mayor was to reduce the residential property tax. Mayor Love is best known for her conservative positions on limited government, increased citizen liberties and limited restraints on business. Love ran for the 4th congressional district seat, which was created after their 2010 census. She won nomination at the Utah Republican Party Convention against her republican opponents Jay Cobb, Stephen Sandstrom, and Carl Wimmer with over 70 percent of the vote. Her opponent for the 2012 congressional election is six term democrat Jim Matheson. Mia Love will be the first black female to serve in the House. Election Results: Mia Love conceded in the congressional race against incumbent and Representative Jim Matheson (D). Matheson lead by 49.3% and love fell behind with 48.1%. Love lost by fewer than 3,000 votes. Love supports fiscal discipline, limited government, and personal responsibility. When approaching an issue she asks: is it affordable? Is it sustainable? Is it my Job? Love is prolife and is supported by the Susan B. Anthony list. Love supports domestic energy exploration, local control of education, second amendment rights, and state control of public lands. Fun Facts: Mia is a wife and mother of 3 children. In her spare time Mia is an avid runner, tread trainer, and accomplished singer and dancer. Regardless of your opinion on the election results, you have to admit this is pretty cool. For the first time EVER an all-female delegation will serve in Congress and will have a female governor. Both House seats up for grabs went to women, both democrats who join republican Kelly Ayotte and democrat Jeanne Shaheen who are already serving. Also, democrat Maggie Hassan took the Governor position. How awesome is this? While catching up on the news, I stumbled across this article by Marlo Thomas. In class we’ve discussed “The Year of the Woman”, or what was supposed to be that year but never quite lived up to it’s expectations. We’ve also discussed the idea that this year might actually be the Year of the Woman. This article ties both together. While we have a lot more women running for office than in the past, this article emphasizes the importance of women continuing to get involved. We can’t stop or slow down just because things look like they might get better. The Muslim Brotherhood political party in Cairo is training women to help them gain more seats in parliament. Currently there are only 5 women out of 213 in Egypt’s parliament. Some people believe that this is a great thing and others think that the Brotherhood is only doing it to make themselves look good. With the stereotype about women and Muslims, what does everyone think of this? Are you angry? Discuss in the comments. And take the pledge.